The Glenelg River formed a natural boundary between two tribes, the Bunganditj to the west and the Gunditjmara to the east. About 4000 people once lived in the wider region in a less nomadic lifestyle than in other parts of Australia. The vicinity of Dartmoor was known as "Pokar" (big place) although there is scant evidence of their occupation apart from a "canoe tree" near Fort O'Hare. However, some of their language is preserved in local place names: Drik Drik (many stones), Winnap (fire or firewood) and Mumbannar (rain). The Village Green site has desirable characteristics in that it is elevated and and has a natural spring for a water supply. 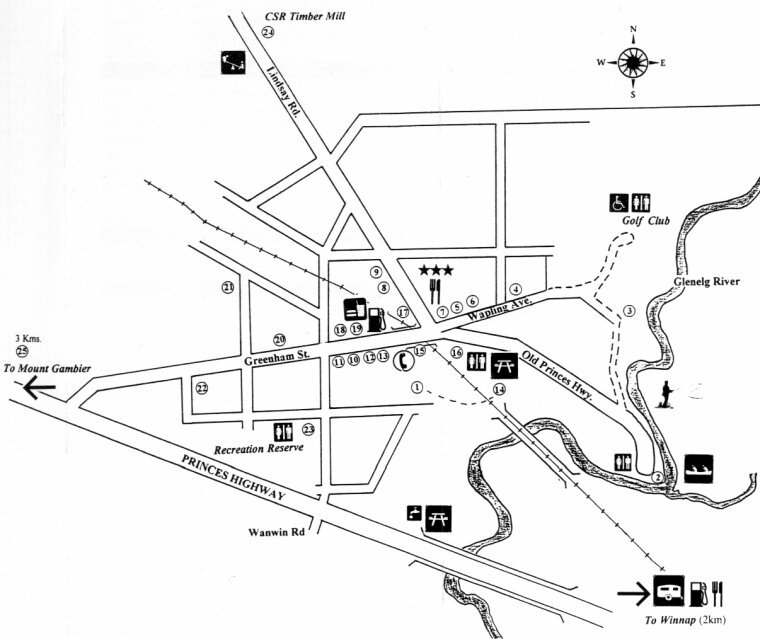 On 18 August 1836, Major Thomas Mitchell on his exploration of "Australia Felix" camped above the junction of the Glenelg and Crawford Rivers on a rounded hill which he named Fort O'Hare after his commanding officer who died at Badajoz in the Penninsula Wars. From here he went to Nelson and after returning journed to Portland where Mitchell was astonished to find the Hentys in residence. The pastoral land to the west of the river was first leased in 1845 by the Scott brothers and was named "Woodford". (The other early pastoral runs meeting at Dartmoor were "Pieracle", "Kinkella", "Snizort" and "Glenaulin".) The fording place at Dartmoor, for traffic on the wool route from Penola to Portland, became the first center of business. The "Woodford Inn" ran by Conway Ferrers existed from 1846 and a later licensee, Thomas Strachan, operated two punts to assist crossings. In 1857 suburban allotments were surveyed nearby for sale; one of the first buyers was George Greenham. The area surrounding the first allotment blocks was used as rifle range between the World Wars; clearing for the golf club behgan in 1977. Police patrolled the Dartmoor area from the 1860's; they were busy at times but the officers did not reside there. The first residence was close to the existing station which opened about 1890 with Constable Moore in charge. Resident action in the 1980's saved the building from demolition. George Spencer, blacksmith, wheelwright and hotel proprietor built the first permanent residence in Dartmoor in 1860 after moving here from Portland. His innwas licensed in 1866 and advertised as "The Good Woman Hotel". 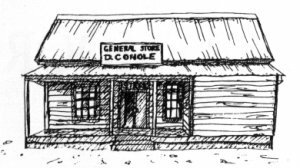 Darby Conole operated a general store on this site from 1878 until his death in 1917. He was a prominent local figure; amongst other duties he was Deputy Registrar of Births, Deaths and Marriages, and the official recorder of rainfall. Originally known as the "Dartmoor Inn" it was built about 1861 probably by William McKay. In 1865 the licence was transferred to George Greenham, and then to Donald McPherson in the 1870's. The original hotel building with later extensions burned down in 1983 and was replaced by the current complex. 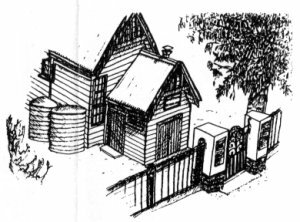 A temporary bark hut preceded the first Presbyterian Church built here in 1880 utilising pit-sawn timber and shingles for roofing. That building was replaced in 1961 by the present Mount Gambier stone structure. First built in 1889 by Mr Farley on land donated by Darby Conole. The first confirmations were carried out by the Bishop of Ballarat in 1909. The current building was constructed in 1959, over and around the old one so that weekly Mass was not missed. 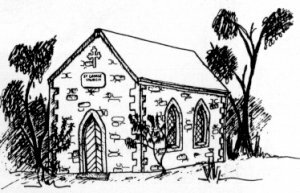 The first church in 1864 was located near the police station; but it was actually a community funded school-building that had been mistakenly built on church-ground! The current structure of field limestone was built in 1885 on private land. 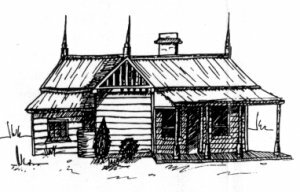 In 1952 the new owner James McIntyre, donated the land to the Diocese of Ballarat. The 1864 school/church (refer 10) was officially recognised in 1871, with Janet Dunbar as Head Teacher. She walked/rode to school from Drik Drik where her husband Charles was teaching. A new building on the current site was erected in 1878 (boards from which now clad the rear shelter shed). In 1914 Premier Sir Alexander Peacock opened a replacement building which forms the central core to the current complex. One addition in the 1980's to the complex was the old Digby School. Postal services began from 1 January 1860 with a loose bag service to determine the need for a post-office. Subsequently an office was established on 2 April 1860; telegraph services were available from 1911. The post-office and residence has been located on this site since 1947. In 1986 during the local 150th Major Mitchell Celebrations, a re-enactment of the horse/wagon Heywood-Dartmoor mail run was conducted. Built in the late 1870's by George Greenham, following surveying of the western portion of the town in 1872. The store which incorporated the post office until 1947 was operated by many families until the 1970's when it became a private residence. The coach-house has a history of uses including; blacksmith, carriage-maker, rendering house, motor-repairer and hardware store. It opened as a museum 26 Jan 1993. The Mt. Gambier-Heywood railway was mooted in 1900, and decided upon in 1912. Surveying and construction began from Heywood in 1913; by May 1914 work had reached Dartmoor and the 968 feet (300m) long wodden-bridge was completed in April 1915. Between 200 and 400 men worked on construction of the line which was opened in November 1917. Passenger trains operated until 1942. In the mid-1980's, resident action did not save the the unique bridge from demolition. 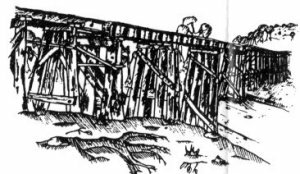 The collection of wattle-bark was an important early industry and following the opening of the railway a weighbridge was emplaced for the trade. Restored by the Dartmoor District Progress Association for the district 150th Celebrations in 1986. Unofficial meeting place and playing field for people prior to the railway construction; the area also has a permanent spring which was used as watering facility for horses and later "iron horses" (steam trains). Area beautified as a public project for the 150th celebrations. One of the oldest wooden buildings in the town, this was the residence and store of Engle Olsen from the early 1900's. His only child was killed in a train accident during the period of construction. Now a private residence. Seventy "Cedar Atlantis" trees were planted in September 1918 to honour the service of sixty local men and women in World War One. (Other Avenues are located at Drik Drik and Greenwald). A plaque naming those commemorated is located ouside the Dartmoor District Memorial Hall and replaces original copper nameplates lost prior to WW2. The first hall on this site was built in 1914 (possibly by Israel Lovell) of hardwood timber and weatherboards. It cost 200 pounds including the piano! Later it was extended, but was burned down in the 1950's. The current stone building was opened in 1958 and dedicated as a memorial to local war veterans. The first saleyards were located opposite the Uniting and Catholic Churches at the turn of the century, but moved later to this site for access to the railway yards. Used mainly by the agents "Dennys Lascelles", the yards were closed by the 1970's. Before and after the Second World War two mills using hard and softwoods operated at this site. The box mill products were in great demand for ammunition boxes and fruit cases. Originally the R.A.O.B. ("Buffs") Hall, it was also utilised by the Brownies (formed locally in 1929) before the Lions Club (chartered locally in 1976) took over management of the building. The first "Showgrounds" were in the vicinity of the railway yards; this site was gazetted later and became the home of football and cricket teams and the Dartmoor and District Show Society from the 1900's. Tennis and netball have since been played here also, but the Show moved to the Mumbannar Reserve in the 1980's. The first planting of pines occurred in 1927 just north of the mill, operated initially by the Forestry Pulp and Paper Company (forerunner to Softwoods). A fire in the early 1950's caused significant damage, but upgrades of facilities over the years have maintained operations to state-of-the-milling-art. Gazetted in 1870, probably on a site that already had a grave located on it. The first recorded burial was in 1871, but unfortunately much of the early records have been lost. There are sectarian compartments, but one interesting grave is outside the compartments and is aligned differently to all others. It belongs to Frederick Bucknall who arrived in Dartmoor from South Africa in 1888 and grew wattle trees for the tanning industry. He lost his money in the bank crash of 1890 and left with his brother for the Coolgardie goldrush; he returned 5 years later with 5000 pounds.